Synopsis: Aaron Cross (Renner) is a black ops soldier under the Outcome program, an off-shoot of the Treadstone and Blackbriar programs that spawned Jason Bourne. After Bourne begins to pull the curtain on the programs, the government decides to destroy all parts of the programs, including Cross. After narrowly avoiding death, Cross joins together with Dr. Marta Shearing (Weisz), who might be able to help him avoid being eliminated. Sarah: a.k.a. Mrs. James Bond! A: Correct! Mrs. Craig stars as Dr. Marta Shearing, a scientist involved with Aaron Cross’ secret program. The Bourne Legacy also stars Edward Norton - a new addition to the series - as Eric Byer, a retired Air Force colonel who sort of oversees some of the black ops programs the CIA runs. So Sarah, this was one of the films we previewed this week, and as we mentioned in our preview over the last three days we have watched the first three Bourne films to get you caught up on the series and to refresh my memory. 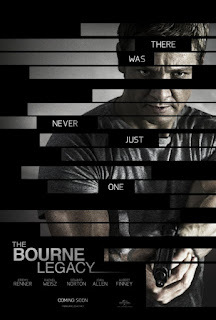 So now that we’re caught up and we saw this almost right after watching The Bourne Ultimatum, what did you think of The Bourne Legacy? S: I was little disappointed in these movies as a whole. I find them to be full of a lot of really tight, confusing information in short amounts of time and then very long sets of action sequences, rinse and repeat. Nothing about them really impressed me much. 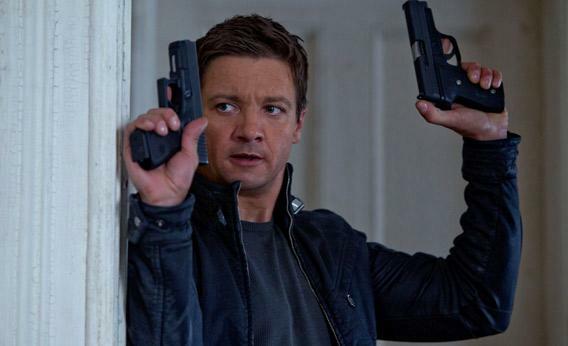 Jeremy Renner does just fine as Aaron Cross in The Bourne Legacy. He's not Jason Bourne exactly, but that's what we liked about him. 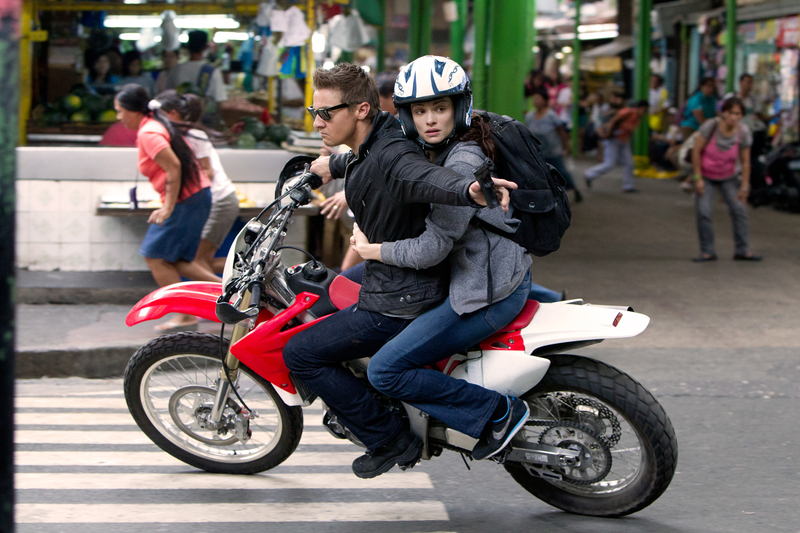 The Bourne Legacy itself is an action-packed film. I think that if you’re a die-hard fan of the Bourne films to begin with you’ll enjoy this installment. It’s another angle of the bigger picture they’ve spelled out through the course of the series and this one adds another facet in that Jason wasn’t the only one. So I think that if you like the Bourne films you’ll like this one. Otherwise if you’re not a fan of the series, you’ll really dislike this one. A: I actually might disagree with you a little bit just in that…I’m not a huge fan of the series but I like the movies…I’d go out and say that fans of the series might not like this one because it is very much a retread of parts and sections of the first three movies. It’s not a reboot per se, or at least the filmmakers say it’s not, it’s a “side-quel” because the first act of the film run simultaneously with events in The Bourne Ultimatum. But sitting through this and watching it, so much of it is very much like The Bourne Identity in that Aaron and Marta team up and eventually sort of fall for one another like Jason and Marie did. And then a lot of this one is reminiscent of The Bourne Supremacy, particularly the last action sequence, which is an overly long foot/car/motorcycle chase between Aaron and this nameless assassin. I think they referred to him as Larx, but I think that was just the name of his program. S: Yeah, it was like his codename and he’s this super-agent that they don’t do ANYTHING with. A: And I didn’t see anything that was more special about him than any of the other agents in the series. So yeah, the final action sequence was just way too reminiscent of the chase scene at the end of Supremacy between Bourne and Karl Urban’s Russian assassin. So there’s a lot of retreading here. That said, I liked it for what it was. There are a lot of parts I like about it. I like Jeremy Renner and I like his Aaron Cross. S: Yes. I really liked Renner. He’s been getting some flak about how people don’t like his Bourne-esque character, but we have to remember that he’s NOT Jason Bourne. He knows who he is, he knows where he comes from. We don’t have to go through the same issues with Bourne. It’s more of Aaron and Marta trying to save themselves because Norton’s Byer is trying to burn the program down in its entirety. A: Yeah he’s way more charismatic than Damon’s Bourne in that regard. Even though he doesn’t say a word for the first 20 minutes or so that he’s in the film. S: But he’s a fun action actor to watch and I look forward to seeing him in more things in the future. Here’s something for me: I don’t quite GET these movies. There are so many layers…and I understand the premise that there are all these cover-ups and it affects so many different branches of the government and other companies involved. I get that. But I don’t understand why that’s not more of the story. S: You know, they’ll throw in scenes where these agents are all talking about having to shut down these programs or hunt down Bourne or Cross, but why not go into that more instead of just buffering it all with tons of action sequences that are really drawn out. All the chase sequences really kind of bored me. I wanted something more like Mission: Impossible or James Bond and I feel like that’s what these films wanted to be like and that they missed the mark. Maybe it’s just me. 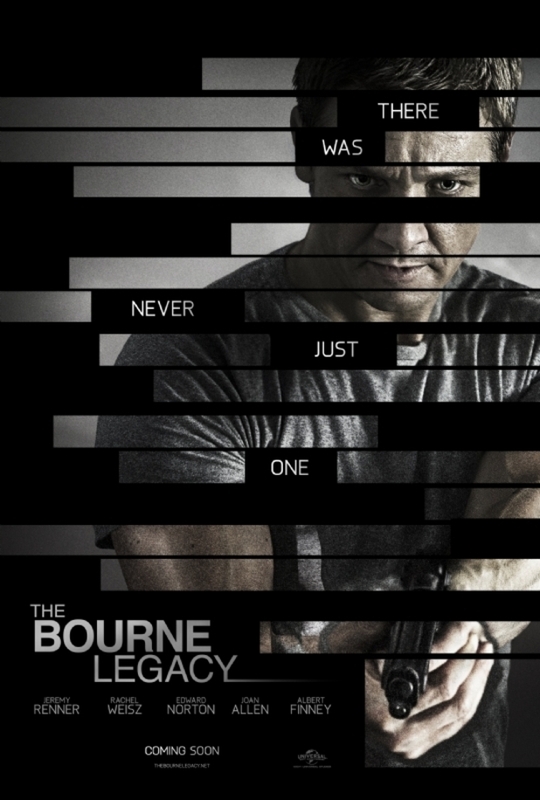 The Bourne Legacy has a run time of 2 hours and 15 minutes. We swear it felt like this chase scene was at least 20 minutes of that. A: That’s a totally fair criticism. I would just respond by saying that I like that these films are a little more physical and more brutal in their action sequences with hand-to-hand combat. I also enjoy watching Bourne and Cross look around their surroundings and situation and quickly evaluate the best way out and how to avoid capture. But those are fair points and I agree with you that I’d like to know more about the programs themselves. Overall I’d say if you’ve seen the other Bourne films, there’s not a whole lot new here. Correction: there are some new things in the first hour where we’re following Cross around Alaska, but after he comes back to civilization it’s a lot like the other films. The film does look great though, and I really liked the homage to the opening of the series with Cross laying in the water to open up this film. The DNA is here. It’s directed by Tony Gilroy who wrote or co-wrote all of the films so he knows the story, he knows the players involved. It’s just that this one didn’t bring enough new stuff to the table to make it more interesting. S: Yup. I was just disappointed. But I didn’t have high expectations for this one anyway so I wasn’t completely shattered that it wasn’t a great film, but it still managed to disappoint me. A: One other thing for me: I wish they had used Edward Norton more here. Like you were saying about how you wanted to know more about the cover-ups. S: Yeah, I don’t understand what his role really was. Was he a part of the CIA or was he part of some other branch that kind of oversaw what the CIA was doing? It just never quite made sense to me. I wish they had used Norton more, I wish they had tied it more into Pamela Landy and her stuff from Supremacy and Ultimatum because at the end all of this seems to be for nothing. A: True, they don’t really wrap this one up, do they? They very much leave it open-ended for a sequel and that annoys me. Cross got his virus he needed to be permanently awesome (the premise of how he’s a black ops solider is ridiculous, too), they’re chased by Larx and kill him and then it’s over. That’s it. S: It is what it is. I think if you like the series and planned on seeing this one in theatres, you should still do so. It’s still a fine action movie. But this is not one we’ll own. We don’t own any of the Bourne movies and I think it’s going to stay that way. FINAL VERDICT: A nice way to kill a Saturday afternoon.